After nearly six years on the Wairarapa District Health Board I still haven’t quite come to grips with just what the Ministry of Health actually does. I do know however that last week it was reported that they had gone cap-in-hand to the government for a bailout of $18 million to complete a $24 million refit to their office tower in Wellington. The refit was supposed to have been paid for out of ‘reserves’, but a miscalculation meant they were well-shy of the mark. How a cash-strapped health system believed it was able to have accumulated twenty-four million dollars in reserves was not explained. Labour’s shadow health minister Annette King insisted the Director-General Chai Chuah resign, but he resisted falling on his sword and claimed others were at fault. 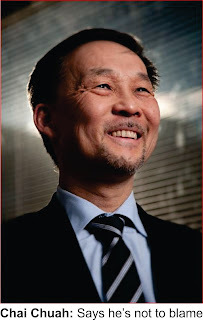 I have met Mr Chuah on a number of occasions; he is a dapper, quietly-spoken Mayalasian gentleman who cut his teeth in this country working with the Canterbury DHB and then was for seven years the CEO for the Hutt Valley DHB. I understand the he was highly-regarded by both boards. According to their website the Ministry’s role is to promote and protect the health and wellbeing of New Zealanders. With a twenty-four million dollar refit it would appear that their own health and wellbeing is a priority. New Zealand has twenty-one district health boards that are semi-autonomous. Often referred to as ‘hospital boards’ in fact they cover all aspects of healthcare in the areas they serve. The government, through the ministry, fund the DHBs on a per-capita basis and most struggle to live within their allocations. Wairarapa’s apportionment is just short of $130 million annually and besides the hospital itself this is used to fund mental health and addiction services - often through private providers - pay the general practitioner subsidies, provide health care for the elderly either in their homes or in privately-owned rest homes, offer dental services for primary school children and fund most prescription medicines. Wages and salaries are the biggest cost. The Wairarapa Hospital has over 200 nurses and more than 40 doctors on the payroll and also spends a small fortune on information technology. We have outlaid millions of dollars on computer software and hardware during my term on the board and are still behind the eight ball in what is considered to be ideal. Recently at a meeting I suggested somewhat facetiously that we would be better-off employing clerks with pencils and paper. This suggestion was (justifiably) treated with derision. And we can’t match the Ministry on the provision of accommodation for our administration staff. Most are housed in the leaky old three-storey rough-cast nurse’s home near the entrance off Blair Street. It was built in the 1940s and has never had a refit. The staff work out of tiny offices that were once the sparse single bedrooms for the on-site nurses of yesteryear. However I don’t think the government would welcome an application for funds for an upgrade. They will still be battling to find the eighteen million dollar shortfall for the flash capital office block rejuvenation. Out here in the provinces, we could build a brand new hospital for that.